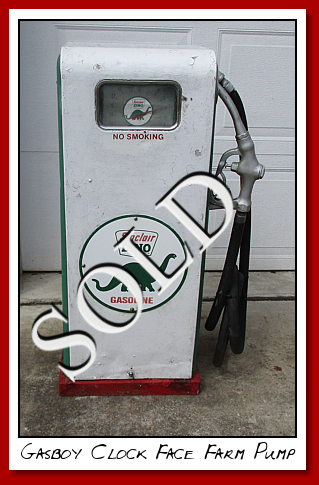 All of these gas pumps are for sale "as is". We will not be restoring any of these. Because we get so many calls asking for pumps with this patina or certain rustic look, we acquired this group of pumps, to satisfy this need. The whole lot has been maintained throughout the years with paint overs...in most cases by brush, as was the practice, right on the island where they were used. Most still have the motor and pumps inside. All have lights that work by using an enclosed power cord that plugs into a wall outlet. " 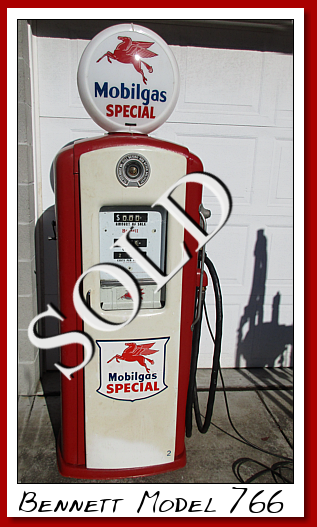 These are not Grade 1 restorations" but are great examples of machines that provided gasoline service to countless motorists over many years. Perfect to display out of doors or in a restaurant, clubhouse, game room, man cave....your choice. They won't last long, so don't delay. We never get this many done up in these colors, at one time. All come as you see them with hoses, nozzles and globes. Very nice Original American Gas globe. 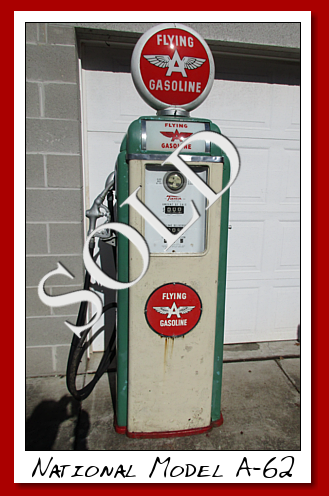 American Gasoline was a small family company. It was founded in Baltimore, Maryland in 1910. 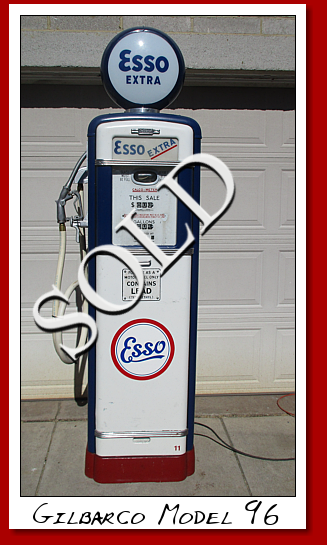 Later it became part of Standard Oil and the name was changed to AMOCO. This is a 15 inch high profile metal body. Excellent "original"condition. Tall Wayne Model 80. Circa 1948. In original paint from previous owner in the Mid-West. 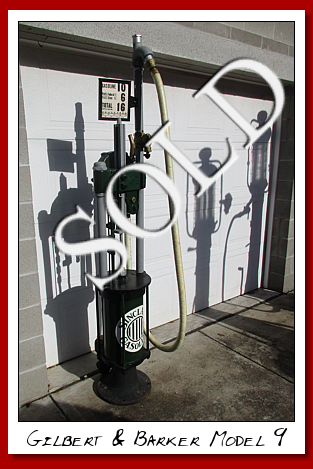 Very nice display pump. One small patch of rust on the lower side but, overall a really nice unit. Globe, hose and nozzle, included. Martin and Schwartz Model 80. Circa 1949. "Cyclops" version. 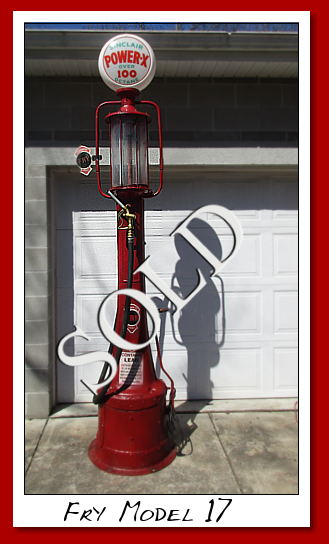 Old restoration with aftermarket porcelain Texaco Fire Chief pump signs. Includes hose and nozzle. Tall Martin and Schwartz Model 80. Circa 1948. 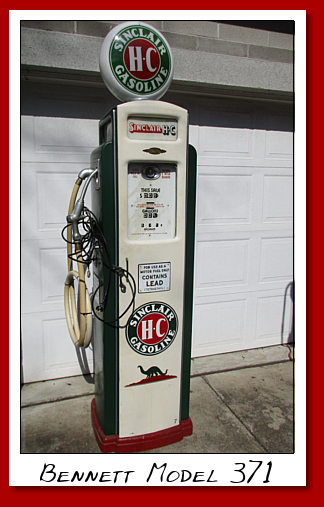 Older restoration to Sinclair gasoline. Globe, hose and nozzle included. 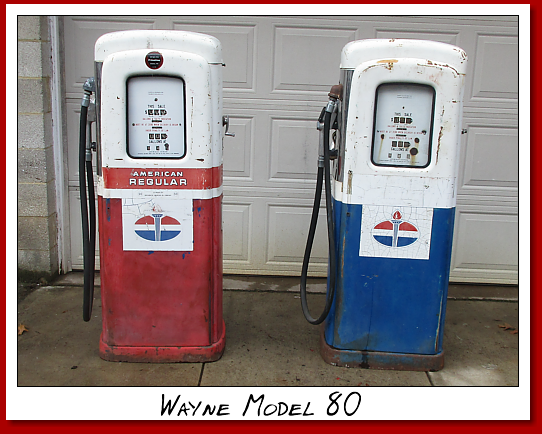 A very nice matched pair of Wayne Model 80's gas pumps. Circa 1950. 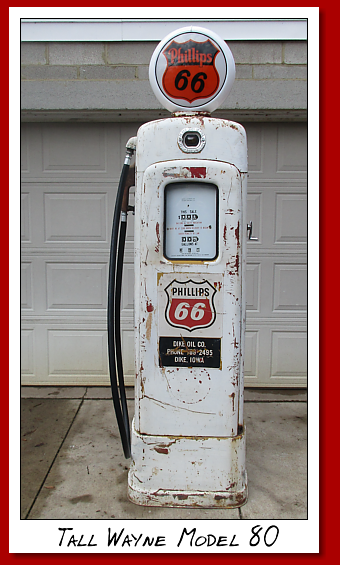 In original American Regular and Premium gasoline. With hoses and nozzles. Easy to add globes, as all the fixtures are in the top. 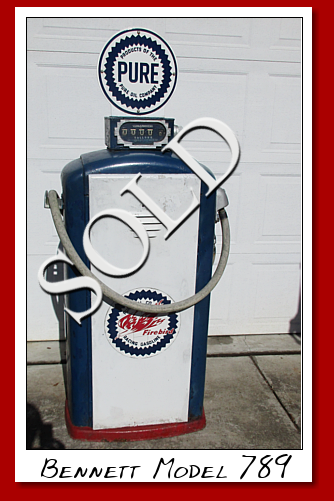 Fry Model 70 Visible gas pump. Circa 1928. Perfect Blue Glass Cylinder. Hail cage. Pump works freely. Original repaints....never restored. A fine display item as is or a great do-it-yourself project. 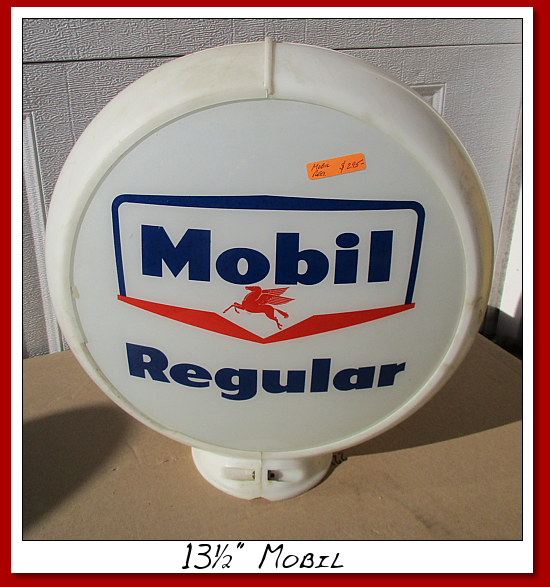 Original Mobil Regular 13 1/2" gasoline globe on original Capco body. Plastic Capco body has chips and nicks but is still sound and strong. Lenses look good. One small blemish adjacent to the chip on the Capco body. Nothing which takes away from the overall good condition. 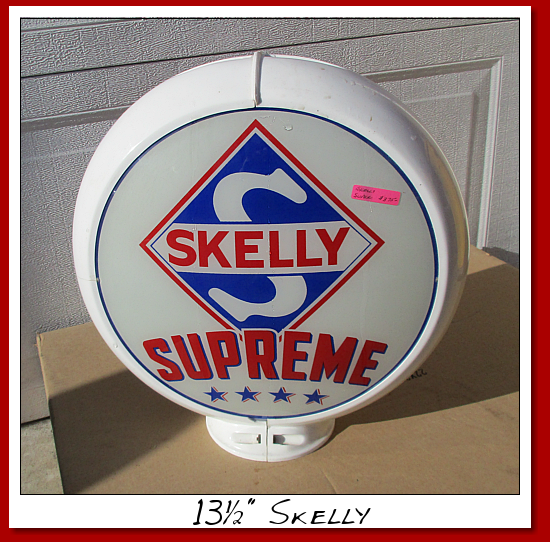 Original....Skelly Supreme four star 13 1/2" gas pump globe. On original Capco plastic body. In very nice condition. No breaks or chips. 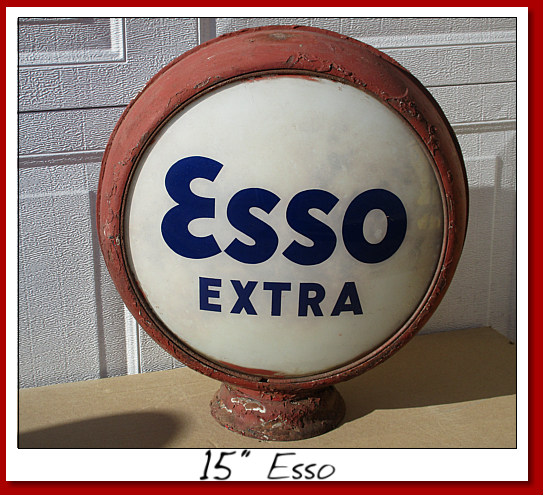 Original...Very Early 15" ESSO Extra metal body gasoline globe. Circa 1920's-1940's. Has a great patina. The body and paint appears to be original and in good condition. Lenses have some staining on the backs. No breaks or chips. 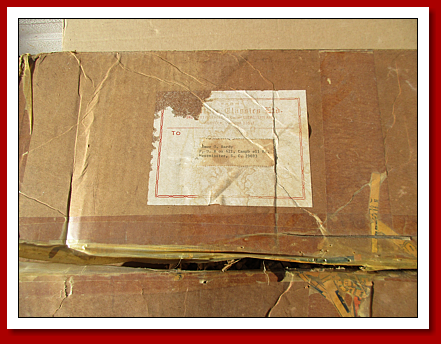 Comes with the original shipping box with the postal label and shredded paper from the supplier....many years ago. Mohawk Gasoline. Martin and Schwartz Model 19-A. Circa 1928. Built in the Martin and Schwartz factory in Buffalo NY., before the company transferred manufacture to the new plant in Salisbury, MD. It was just acquired at a sale. This is an older restoration, not by us. The paint is good as is overall condition. Lighted faces and repro globe. Brass nozzle and new black hose. 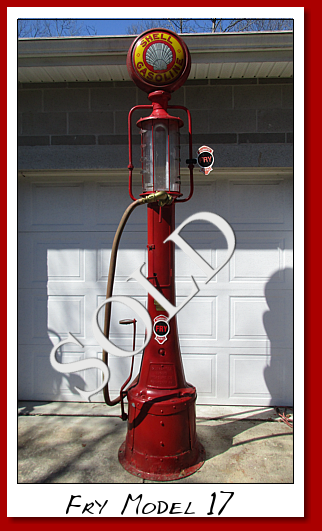 Clock Face gas pumps are very hard to find and this is a fine example of an early unit. At auction, these are bringing between $5,000. and $10,000. Here is your chance to own one at a reasonable price. Bennett Model 371 Circa 1938. 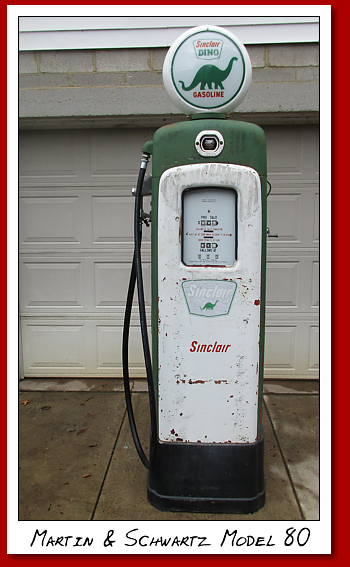 Sinclair HC brand of gasoline. the pump and motor has been removed from this pump. It has several shelves inside. Hinged doors allow access. Martin and Schwartz Model 80. Circa 1948. 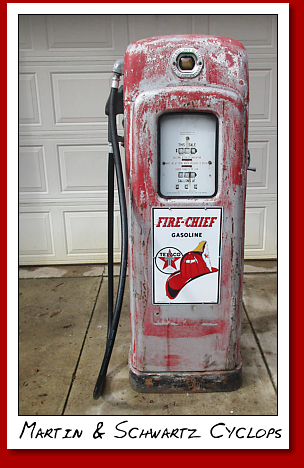 Texaco Firechief with porcelain door signs. 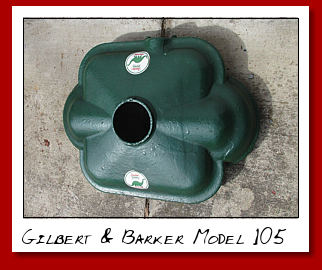 Gilbert and Barker Model 105 Clock Face pump top. Circa 1930. All cast iron construction. Top only. 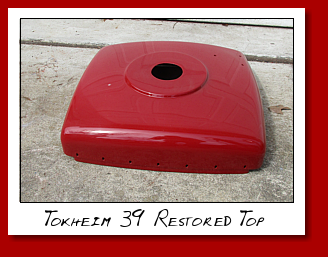 Tokheim 39 restored top. Circa 1948. All bodywork has been done and it is painted red. Top only. 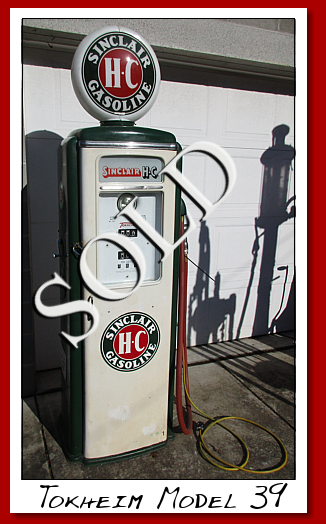 Birmingham 5 gallon visible gas pump. In original Cities Service livery. 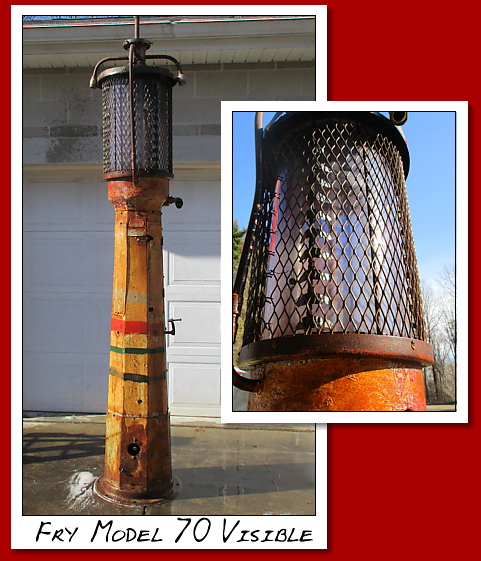 I replaced the hose, otherwise, all original and a great piece of history. 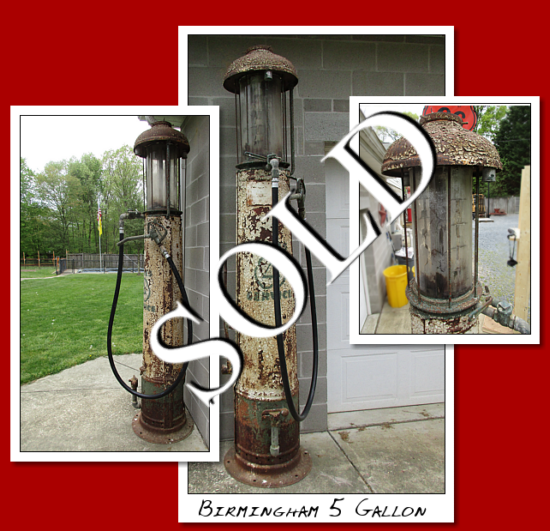 The Birmingham Machine and Foundry Co; of Birmingham, Alabama was in business since 1883 but only manufactured a gas pump in 1926. Unsure how many were built during 1926? 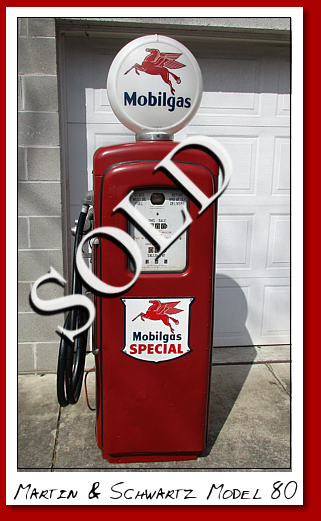 After this one year run, the company no longer produced any other gasoline pumps. In all my years of being in this business, this is the only one I have ever seen. It has a really good look with the paint cracking but still holding on. Cylinder is not chipped or have any holes. A little rust at the back bottom, easily fixed. Missing access door which again is an easy to do. Otherwise, absolutely straight and true to the era. Fry Model 17. 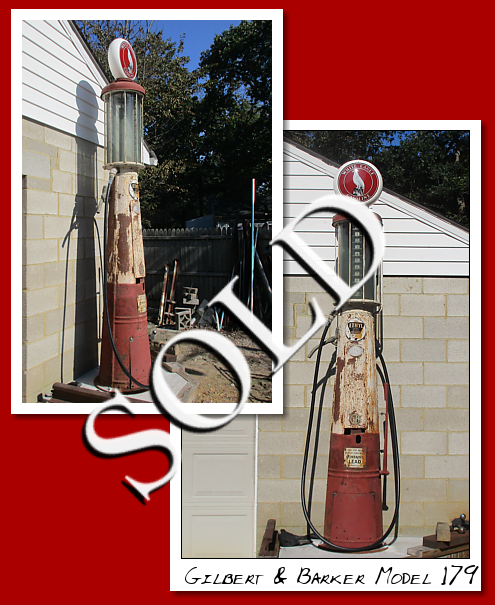 Five Gallon Visible gas pump. Circa 1925. 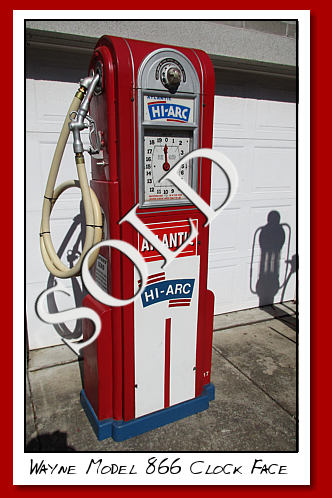 Restored to Sinclair H-C gasoline. Very nice restoration done, but not by this shop. Perfect original clear glass cylinder. Filling tube operates, up/down with gallon level fingers inside. Pump works freely. Re-production metal body globe and lenses. New black hose and original brass nozzle. Lighted and ready to display. Has a bit wear due to being moved. Overall a Great Pump from the "Roaring Twenties". 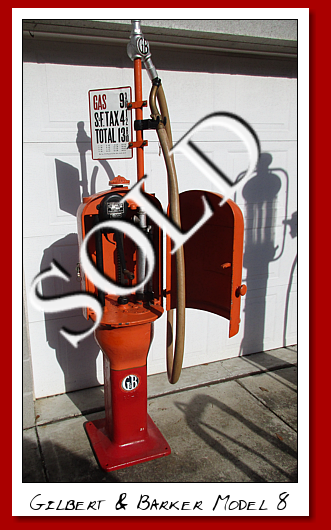 Gilbert and Barker Model 179 Visible gas pump in White Eagle gasoline. As discovered with perfect blue glass cylinder. Displays quite well in the patina of years in the elements. 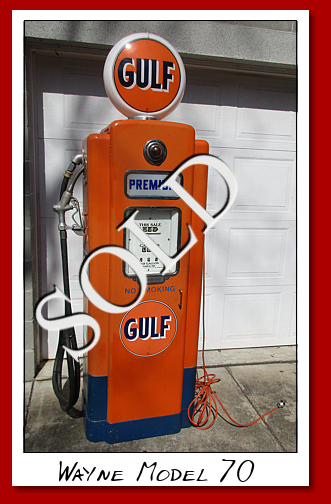 A fine piece of petroleum history. 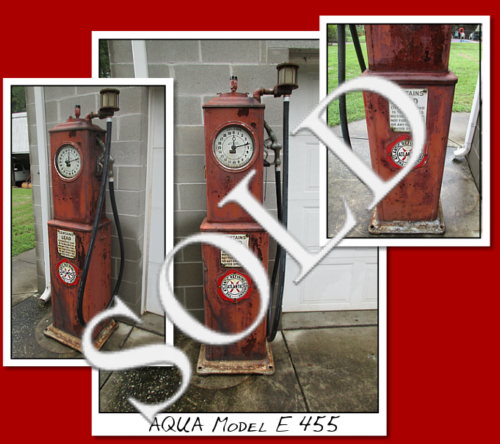 We just got this great AQUA Model E 455, clock face gas pump into our shop. Circa 1931. It is as found. Has, what appears to be, original factory paint? Original Atlantic " Fried Egg" porcelain pump signs on front and back.....called this because they resemble eggs being cooked in a skillet. Original Contains Lead signs on both sides as well. AQUA pumps are very hard to find and are in great demand. Some would consider this pump on the RARE side. We have never had a better example of one. Metal is straight. Porcelain faces are perfect. Has one cracked glass. Only surface rust and not much of that. Beautiful example of style and grace in a workhorse of a machine. Gilbert and Barker Model 96 Circa 1938. Good condition. Gilbarco Model 996 Circa 1948. 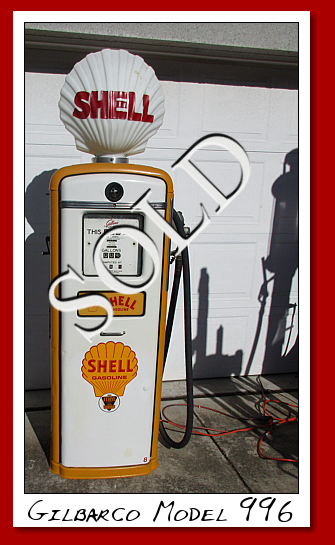 In Shell gasoline with white milk glass Shell Clam globe. Gilbert and Barker Model 9 Early Curb Pump.Circa 1911. 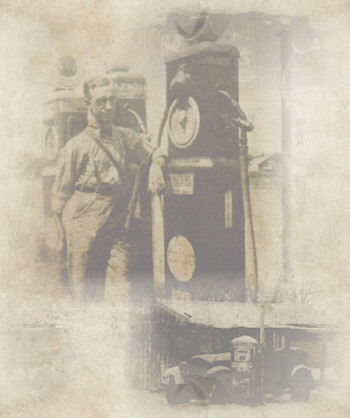 Nice example of early gasoline vending history. 107 years old. 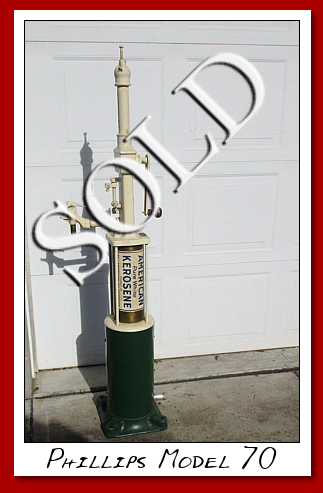 Phillips Model 70 Kerosene/coal oil curb pump. Circa 1900. These were used in country and hardware stores to supply oil to light lamps and oil stoves for cooking. Most people did not have electric at this time and had to rely on kerosene. American decal adds the right aged look. Gilbert and Barker Model 8 Circa 1908. Clam shell doors for security, with keys. Cast iron throughout. Nice unit. Great condition for 110 years old. 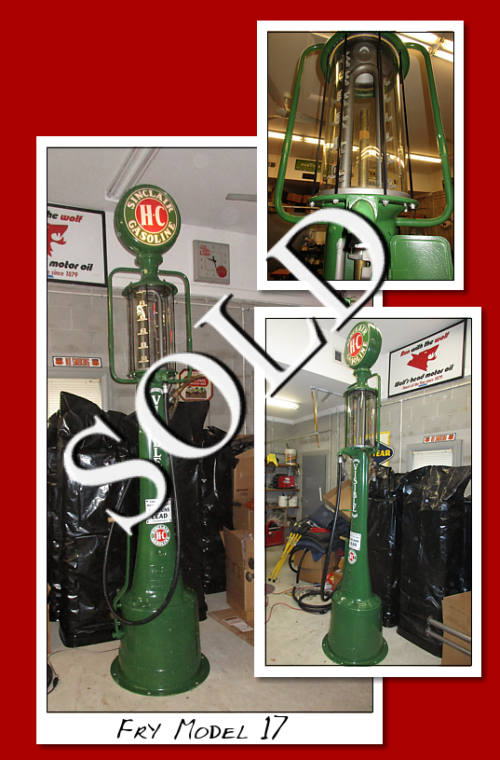 Fry Model 17 Five Gallon Visible gas pump. Circa 1925. Perfect glass cylinder. Correct metal body with Shell lenses. 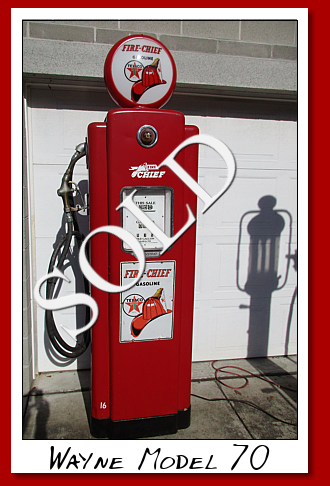 Fry Model 17 Five Gallon Visible gas pump. Circa 1925. In Sinclair Power X gasoline. Comes with new glass cylinder to replace the plastic cylinder in the picture. 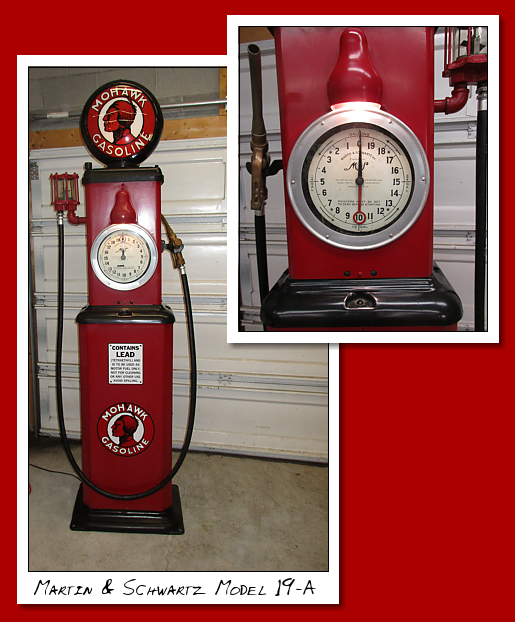 Gilbert and Barker Model 106 Clock Face gas pump. Circa 1930. 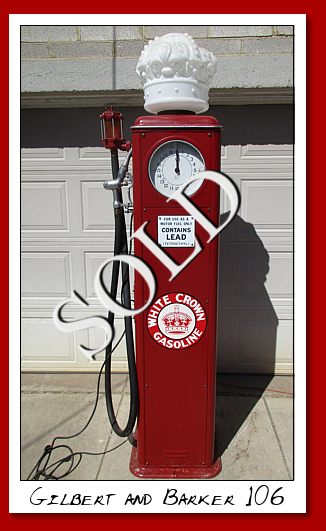 In Standard White Crown gasoline. Has proper milk glass White Crown globe. 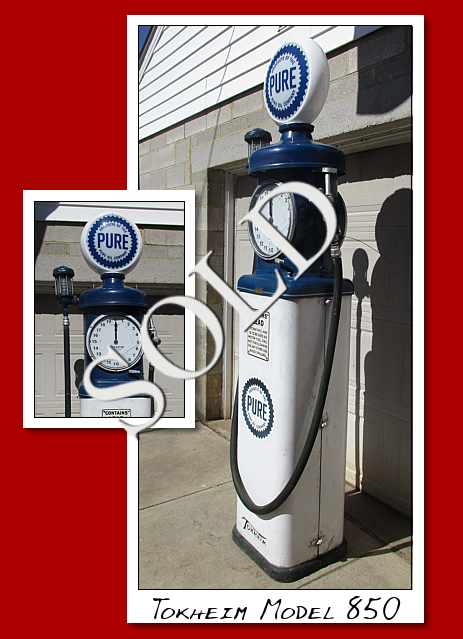 Tokheim Model 850 Square Base Clock Face gas pump. Circa 1931. In Pure gasoline. Gilbarco Model 96. Circa 1941. 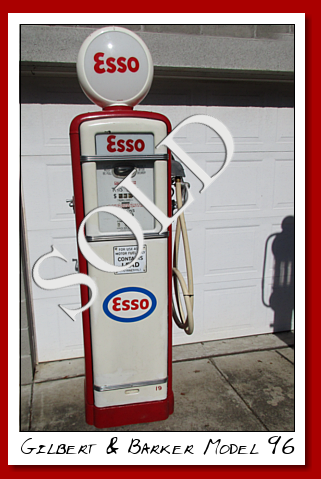 In Esso Extra gasoline. Tokheim Model 39 Circa 1948. In Sinclair HC gasoline. Bennett Model 789. Commercial vendor. In Pure gasoline. National Model A-62. Circa 1948. In Flying A brand gasoline. Bennett Model 766. Circa 1948. In Mobil Gas Special. Has shelves inside for display. Martin and Schwartz Model 80. Circa 1948. Mobil Gas branded with porcelain door signs. Wayne Model 60 Circa 1937. 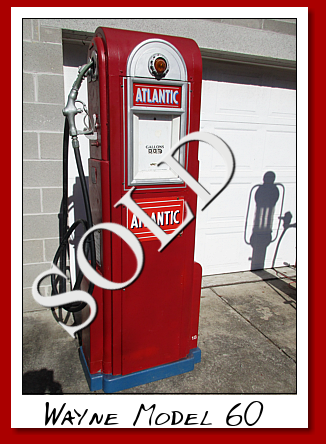 Original Atlantic pump. Motor/pump inside. Replacement sight glass replacements included, as these are incorrect and broken. Good overall condition. Wayne Model 70 Circa 1941. Gulf No Knox gasoline branded. Pump and motor have been replaced with shelves. Gasboy clock face farm pump. Circa 1955. Wayne Model 866 Clock Face. Circa 1935. Wayne Model 70 Circa 1939. 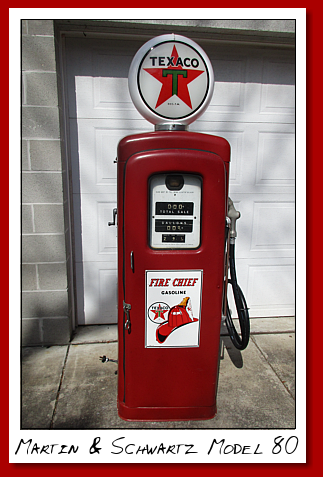 With the Texaco Firechief globe and pump door signs. Good condition.